This may have been covered numerous times in various places already – it’s about 4 years old now – but I only just got round to starting to watch the World Poker Tour box set, so – as usual – I’m just a little bit behind the times. In any case, it’s still just wrong. When I was watching this with Claire, we diligently paused the DVD to work it out I said at first that you’d be about 70% favourite, whilst she said about 75% and I said, well actually yes that’s probably more like it. You’re clearly a favourite as over half the deck improves you hand and there are two cards to come. 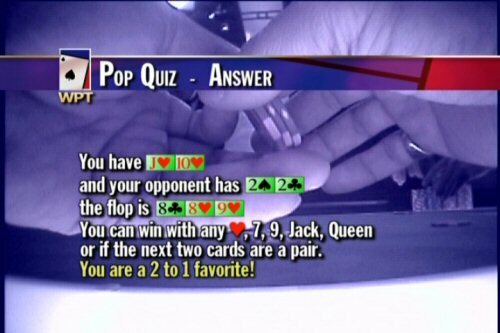 So, according to WPT you have any heart (9), 7 (3 non-hearts), 9 (3), J (3) or Q (3 non-heart) to win. But you can also win with the other 3 10s, and somehow they’ve missed this! As if 21 outs wasn’t enough, you actually have 24. There’s so many outs here that the rule of four isn’t close to accurate, and the full house redraw to lose or running pair to win makes it pretty tricky to work our from first principles, even if you can divide numbers into 45 and 44 in your head! The rule of four would make you a 96% favourite on the hand, and with that logic the universe starts to falls apart. However I couldn’t believe that you’re only 2-1 here so I had to plug it into a calculator to find out if they got that wrong too… but alas no, the answer was just over 69% - a bit better than 2-1 but not as far ahead as I thought. What use this is I don’t really know, although it’s made me – somewhat compulsively – check out how the open-ended straight flush draw looks against various other hands. You’re in pretty bad shape against an opponent holding 88 or 99, of course. But you’re also behind to any overpair, the worst situation being QQ with the Q of hearts where you’re actually worse than 40% to win, and even ace-rag of hearts is just beating you. Here’s what I didn’t consider and have subsequently learned, thanks to the WPT’s mistake! The pair on board with two cards to come gives an opponent with any pocket pair a 17% chance to make a full house. So even if you do improve to a straight or flush, you’ll still lose this hand one time in six. If the board is not paired, you’ll only lose to a full house one time in 35.